* According to request of customer we can consider variants of manufacturing forgings of rectangular section, octagonal section and others. Forgings are heat-treated in chamber gas furnaces automatically according to the requirements of normative and technological regulations. It is possible to perform heat treatment (normalizing) according to the program of customer, as well as, upon request of customer, heat treatment (normalization) can be excluded from the process technology. There is possibility of control on the radial runout of finished product and fixes to the required parameters (as agreed with customer) for round forgings. The production line has the right press. 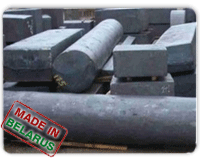 To ensure the purity of forgings surface the module line has shot-blasting machine on which we can make descaling.